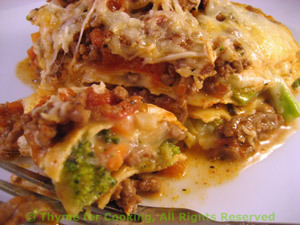 Beef and Broccoli Lasagne, Thyme for Cooking easy Sunday supper. 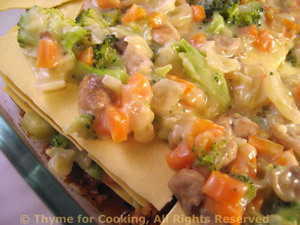 This is a hearty lasagne with a vegetable Béchamel sauce, filled with carrots, onions, mushrooms and broccoli and layered with fresh mozzarella cheese. Peel and chop the carrot and onion. Trim and chop the mushrooms. Heat butter and oil in a large skillet. Add vegetables and sauté until tender, 12 - 15 minutes. Slowly add milk, stirring constantly as it thickens, until it is all added. Continue stirring until it just starts to simmer. Remove from heat. Heat oil a large nonstick skillet. Add garlic and sauté briefly. Add beef and brown well, breaking it up. Open tomatoes and roughly chop, reserving juices. Add tomatoes, juices, sauce, paste and herbs to beef. Bring to a simmer and let cook, uncovered 5 minutes. Slice the mozzarella as thinly as possible. Cover and bake 425F (215C) for 25 minutes, or until noodles are done. Test in center with a sharp knife. Uncover, sprinkle with Parmesan and bake 5 minutes longer to brown cheese.